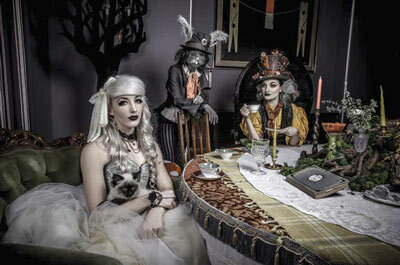 This image by last year's 16x20 avant-garde winner, Alistair Campbell is a perfect illustration of detailed propping, good casting and fabulous makeup.Even the cat manages to harmonise with Alice's overall look for goodness sake! The Mad Hatter's headgear is a masterpiece in its own right, thetable cloth is a work of art. The greens and oranges throughout are matched, right down to the candles. The book on the table is an old copy of Alice inWonderland acting as a title in itself. And this isn't even the best shot of Alistair's series, we are keeping his powder dry for later in the year! Camera: Canon EOS 5D Mark II, EF17-40mm f/4L USM at 24mm. 1/160, f18, ISO160.